Lowest prices all the time, guaranteed! If you find a better price, let us know. 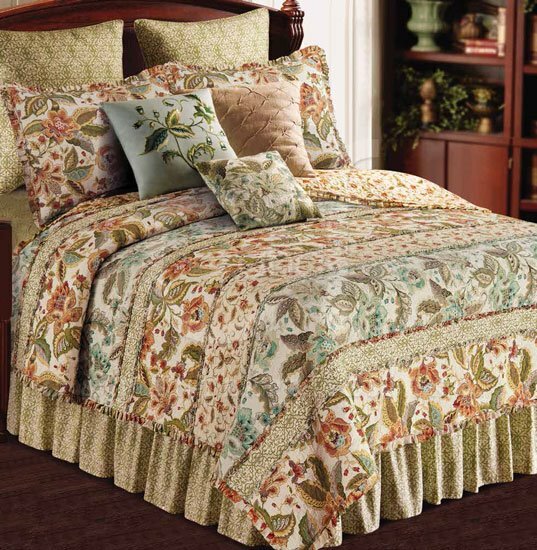 Elsie Quilt bedding by C & F Enterprises has pieced bands of two color combinations of a tapestry floral design with a coordinating smaller print and fretwork design. One print has bronze tones mixed with shades of green and terra cotta on a cream background. The other print has muted shades of green and blue on a cream background. Matching shams are sold individually. The euro shams and bedskirt are offered in a green fretwork design on an ivory background. Coordinating throw pillows, window treatments and a rug are also offered. 100% cotton and machine washable. Elsie Full Queen Quilt is pieced in bands of two color combinations of a tapestry floral design with a coordinating smaller print and fretwork design. One print has bronze tones mixed with shades of green and terra cotta on a cream background. The other print has muted shades of green and blue on a cream background. Mini ruffle at edge. Cotton filled, prewashed. Luxury Oversized. 90" x 92". Reverses to Amelia Petit Floral. We offer the complete ensemble in the Elsie pattern. ElsieKing Quilt is pieced in bands of two color combinations of a tapestry floral design with a coordinating smaller print and fretwork design. One print has bronze tones mixed with shades of green and terra cotta on a cream background. The other print has muted shades of green and blue on a cream background. Mini ruffle at edge. Cotton filled, prewashed. Luxury Oversized. 108" x 92". Reverses to Amelia Petit Floral. We offer the complete ensemble in the Elsie pattern. Tapestry floral design with bronze tones mixed with shades of green and terra cotta on a cream background. 20" x 26". We offer the complete ensemble in the Amelia pattern. Fretwork design in green on ivory background. 26" x 26". Designed to be used behind a standard sham. Design in green on pearl white background. Gathered, split corner, 18" drop bedskirt. 39" x 76". Design in green on pearl white background. Gathered, split corner, 18" drop bedskirt. 60" x 80". Design in green on pearl white background. Gathered, split corner, 18" drop bedskirt. 78" x 80". Bronze toned floral with terra cotta and shades of green on cream background. 14" x 14". We offer the complete ensemble in the Amelia pattern. Cream pillow with tuckstitched detailing. 18" x 18".